I have been reading the book Mindhacker by Ron and Marty Hale-Evans. It is a collection of 60 tips, tricks and games to take your mind to the next level. 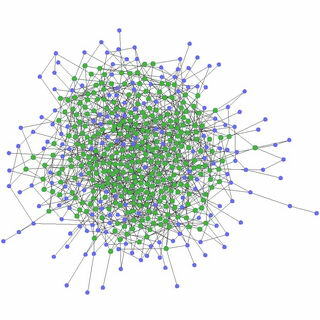 This blog article is about a Perl script developed by Ron to take two search terms at random from a file of his “obsessions” then send a query to Google. Each line of text is a valid Google search term, for example, “mind hacks”. I recoded the script in Python and made it available at the end of this post. Update: A GUI interface version is now available. Read on! You can run the script with no arguments (python ii.py) so two search terms are chosen, or you could add a search term to combine with one of your obsessions. For example python ii.py ELearning will fuse the topic of ELearning with one of your obsessions. I then created a shortcut to this bat file and placed on my desktop. I changed the icon to a world globe. Now I can double click this shortcut for some random Google search results on my interests and obsessions. The GUI version shows a dialog box with text entry areas for the two arguments. Enter one or more search terms then click the Google Search button. A new tab is opened in your browser with the results of the search. 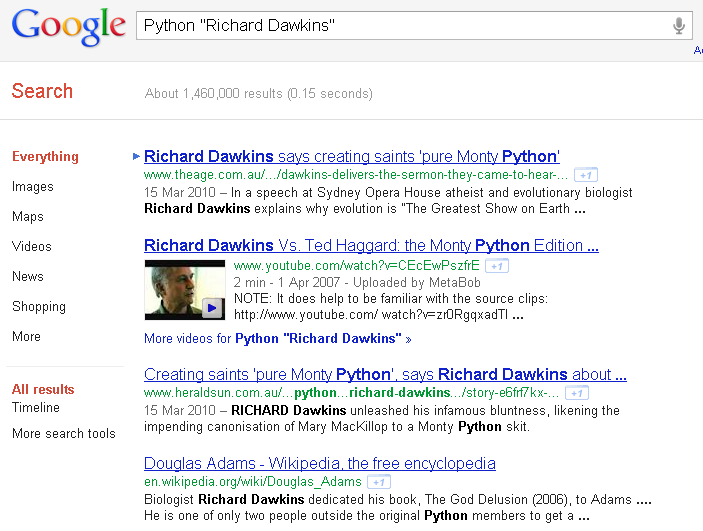 In the above example, I entered Python and the program joined this search with Richard Dawkins from my obsessions file. Click the image below to view actual size. I have a lot of fun continuously clicking the Google Search button then viewing the results. As I think of more areas of interests I update the obsessions.txt file. Enjoy this hack! The script iigui.py – save with extension pyw (on Windows) and update your short cut to run this script. Python on Windows will run the script without a command shell. Read this link if you are having problems installing Tkinter. The original obsessions.txt file from Ron. I will upload my file once I have refined the contents. The iigui.py(w) script needs some minor updating for those who are trying to run it after downloading python 3.x – it is now “tkinter” with a lowercase “t” – tkMessageBox is now tkinter.messagebox. I use this script more than 3 times a week. thank you!